Gripping the infamous cables of Half Dome. A warm #Hashtag59 welcome to Holly B! Holly is an avid National Park goer and thriving entrepreneur with her business HERE. Also follow along with her adventures on Instagram HERE and Twitter HERE. Earlier this month, my husband, Jamie, and I visited our 34th national park—part of our quest to make it to all 59 before we kick the bucket. Thanks to social media and the increased visibility of the National Park Service, it seems our quest is a bit more common now, but is something we started seven years ago after making it to four of the parks. You get the point. I could go on and on. But for my first post here on Hashtag 59, in the spirit of Halloween, I’ll break it down for you and share some thrilling moments that have taken my breath away in the first five national parks we visited. As a kid who grew up exploring the woods behind my house, I’ve always been outdoorsy, but not really adventurous. And as I get older, I’m even more tentative. I grab the chain when it’s provided. I’m amazed each time I scramble up a boulder without falling and breaking something. Imagine my surprise when we found ourselves unexpectedly hiking down Beehive Trail in Acadia National Park. It was a grey Maine day but a beautiful hike nonetheless. Acadia was the fourth park we visited, and in the early years, we didn’t do nearly as much research as we do now. The great thing about Acadia is there are multiple small trails that connect, so we grabbed a basic map, saw all the interconnecting paths and stared exploring. We found ourselves at the top of Beehive, wondering where the trail went. Hint: It went DOWN. The route follows Beehive peak’s steep south face and features iron rungs to climb up (key word: up), handrails, and stone steps. You know how a ladder is often scarier climbing down than it is up? Yeah. I often uttered some choice words, which Jamie often met with, “This is awesome!” I had to silence those particular words while hanging out on an exposed area as a church youth group made its way up the trail in the correct fashion. Making my white-knuckled way down. If you do this hike, I recommend taking the correct way up so you’re not a scared salmon swimming the opposite way. For us, as we often say when things don’t go as planned (or recommended), hiking up it is another reason to go back. But in the end, the experience truly was awesome. Until I was in my 20s, I had never really been outside of my home state of Missouri, unless you count crossing the state line into Kansas. I’m making up for that now. Grand Canyon National Park was the third national park we visited, and I had flown over it but will never forget the moment I saw it for the first time. Traveling with another couple—dear friends who also love our national parks—we cranked the Black Eyed Peas song, “Now Generation,” because we wanted to see it NOW. We pulled over at the first available turnout, where I leapt out of the rental car almost before it came to a complete stop and danced around like a fool. Our first looks at the canyon—after I had calmed down a bit. Hiking out of the Grand Canyon a couple of days later also took my breath away—but for obvious reasons. While I’ve experienced countless awe-inspiring views since then, that level of “first looks” euphoria and wonder was a feeling I’d never had before and doubt I will again. 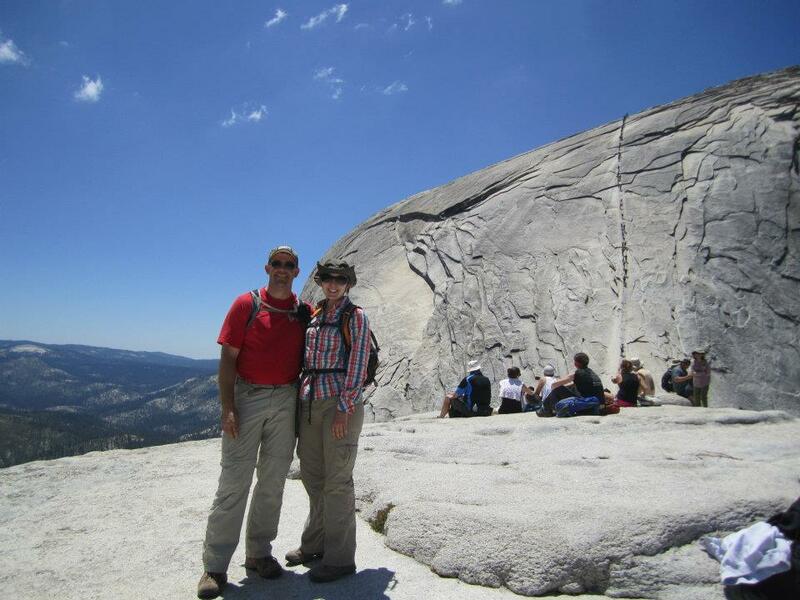 While it’s challenging to say which park is my favorite, I can easily share my favorite national park moment—ascending Half Dome in Yosemite, the fifth national park we visited. To do the 16-mile hike with 4,800 feet of elevation gain, you first experience the thrill of winning the permit lottery that exists to protect the area, improve safety and reduce crowding. The hike to the base of the final ascent is challenging and beautiful, and I found myself reaching for my energy chews and asthma inhaler on more than one occasion. When we finally got to the cables—necessary to climb the final 400 feet—I saw people making their way up and my heart rate increased yet again, but for the first time that day, it wasn’t because of exertion. “I don’t think I can do that,” I muttered, having flashbacks of being the kid who scurried toward the roller coaster chicken exit. But I did. Don’t let the smile fool you. I was in freak-out mode. Once we got on the cables and started making our way up, fear was replaced with excitement and appreciation for fellow hikers who offered encouragement to each other, then elation as we got to the summit. Each time I see the iconic Half Dome image, it brings back those memories combined with immense gratitude to know we stood on top of it. In addition to thrilling experiences, I’ve had some spooky moments in our national parks, for sure. So far, they’ve been unfounded, like the slightest noise coming from outside the tent conjuring visions of a The Revenant–like grizzly bear mauling. But the key is to push past those fears and fully breathe in the experience—even if it’s hard to find your breath. Have you done any of these hikes? Put any questions or thoughts in the comments below! Sign up for the emails to win great #Hashtag59 Limited Edition Prints.